Batteriser: It’ll Extend Battery Life, Just not as Much as Claimed. Alkaline batteries are something that many of us have come to accept as a necessary evil. Either you pay up the premium price for the good batteries, and hope that their claims are as good as they say they are, or you risk it with a giant pack of cheap ones hoping that you don’t have to replace them every other week. They’re less of an issue now that decent rechargeables come as standard for many devices but I can count at least 4 devices in my living room still powered by these disposable power packs. I’ve heard all sorts of strange ways to extend the life of these things, from tapping them on something or warming them up in your hands, but none really provide a good solution. Batteriser purports to be able to squeeze up to 800% more life out of your alkaline cells, all by slipping on this thin metal sleeve. All alkaline batteries start out their life providing a healthy 1.5v to the device they’re powering. As batteries become depleted however their output voltage begins to drop, slowly tapering down before dropping off a cliff depending on battery formulation. This is how all modern battery meters, including the one in your phone, work: by comparing the current output of the battery against its ideal voltage and then giving you an estimated amount of percentage left. Batteriser’s claim to fame is that, regardless of the current output of the battery, it will boost up the voltage to 1.5v making it appear “new” until all the chemical energy runs out. On the surface that might sound like some form of wizardry but it’s a well known circuit referred to as a Joule Thief. Essentially the Batteriser device is a DC to DC converter, one that takes a wide range of input voltages and boosts them up to 1.5v. They’re coy on exactly how far down their converter can go but considering that most batteries become completely unusable past the 0.6v range my guess is that they don’t work past that. Their claim is that most devices will consider a battery dead below the 1.4v range which, if you take the rather gross assumption battery capacity decreases linearly as a function of voltage (which the graphs I liked to earlier clearly show is false), then they can provide almost 800% more life out of a single AA battery. That claim, as you can probably guess, is well out of touch with reality. This isn’t exactly a new and unknown phenomenon, it’s an inherent property of any kind of chemical battery that you’ll find on the market today. 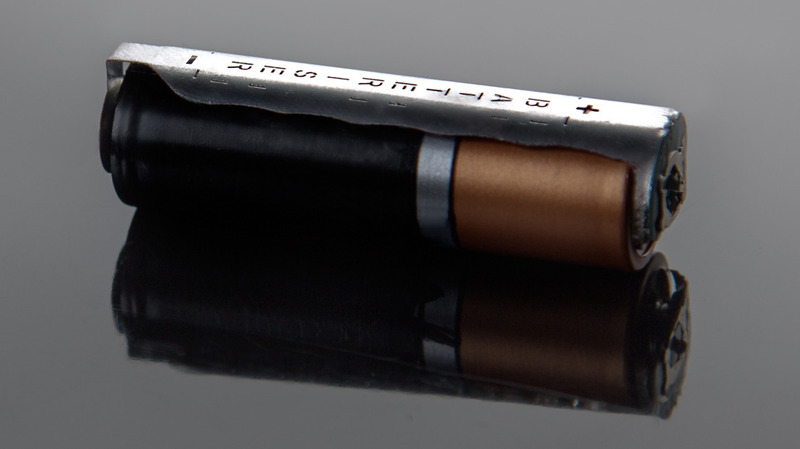 Developers of products that use alkaline batteries know this and will often include circuitry of this nature within them in order to make their devices last longer. Indeed it doesn’t take long to find numerous home made versions of such a device, albeit with far less slick packaging than what Batteriser is showing. So, if the claims in the patent match the final production device, it might be able to squeeze some more juice out of your batteries but I wouldn’t be surprised if the additional life you got wasn’t as great as they claim it is, especially for any modern portable device. The real innovation here is the miniaturization of the whole package which, admittedly, is quite neat in its own right. However the claims they’re making are wildly out of alignment with reality, something which isn’t going to help their case when the eventual Indiegogo campaign hits. Still I’d be interested to see just how well it functions in the real world as even a simple doubling of battery life would likely be worth the asking price (currently $10 for 4 of them, reusable). At the very least it’s on the plausible side of these kinds of crowdfunded projects rather than being outright snake oil like we’ve seen so many times before. The idea behind Kickstarter is a great one: you’ve got an idea and you’ve got the fixins of a potential business going but the financial barrier of bringing it to market are keeping you from seeing it through. So you whip up a project on there, promise people rewards or (more commonly) the actual product you’re intending to sell and then wait for backers to pledge some cash to you. For the backers as well its great as if the project doesn’t get fully funded then no one has to donate any money, so your potential risk exposure is limited. Of course Kickstarter take their slice of the action, to the tune of 5% (plus another 3~5% for the payment processing) so everyone comes out a winner. It’s a disruptive service, there’s no denying that. There are many products that wouldn’t have made it through a traditional venture capital process that have become wild successes thanks to Kickstarter. This of course gets people thinking about how those traditional systems are no longer needed, I mean who needs venture capitalists when I can get my customers to fund my project? Well whilst I’d love to believe that all we need for funding is crowdsourcing tools like Kickstarter I can’t help but notice the pattern of most of the successful endeavours on there. They’re all done by people who were already successful in the traditional business world. Take for instance the latest poster child for the success of Kickstarter: The Double Fine Adventure. For gamers the Double Fine name (and the man behind it, Tim Schafer) is a recognizable one, having worked on such cult classics as The Secret of Monkey Island, Grim Fandango and releasing others such as Psychonauts and Brutal Legend. Needless to say he’s quite well known and made his name in the traditional game developer/publisher world. Kickstarter has allowed him to cut the publishers out of this particular project, putting more cash in his pocket and allowing him total control of it, but could someone without that kind of brand recognition pull off the same level of success? For all the successes that are seen through Kickstarter only 44 percent of them will ever actually get the funding they require. Indeed in the Video Games category the highest funded game (there are a lot of projects in there that aren’t exactly games) before the Double Fine Adventure managed about $72,000. Sure it’s nothing to sneeze at, it was almost 6 times what they needed, but it does show the disparity between relative nobodies attempting a to crowdfund a project and when a well known person attempts the same thing. Sure there are the few breakout successes, but for the majority of large funding successes you’ll usually see someone who’s already known in that area involved somehow. Now I don’t believe this is a bad thing, it’s just the way the process works. Nothing has really changed here, except the judgement call is shifted from the venture capitalists to the wider public, and as such many of the same factors influence if, when and how you get funded. Name recognition is a massive part of that, I mean just take a look at things like Color that managed to pull in a massive $41 million in funding before it had even got a viable product off the ground just because of the team of people that were behind the idea. Kickstarter doesn’t change this process at all, it’s just made it more visible to everyone. Does this mean I think you should keep away from Kickstarter? Hell no, if you’ve got a potential product idea and want to see if there’s some kind of market for it Kickstarter projects, even if they’re not successful, are a great way of seeing just how much demand is out there. If your idea resonates with the wider market then you’re guaranteed a whole bunch of free publicity, much more than what you’d get if you just approached a bank for a business loan. Just be aware of what Kickstarter does and does not do differently to traditional ways of doing business and don’t get caught up in the hype that so often surrounds it.